We hope everyone had a very Happy Easter. While we all love the egg-giving Easter Bunny there are some other rabbits who haven't been so welcome. This is part of their story, which isn't quite as pleasant. Rabbits were said to have been discovered between Carnamah and Three Springs in about 1908. A government trapper was sent up from Perth and caught a few and then couldn't find traces of any more. 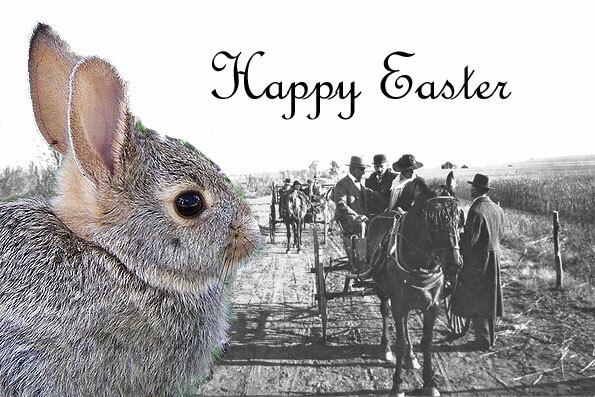 Reports resurfaced in 1911 that the rabbits were back. The plan at that time was for landholders to destroy rabbits on their properties until the rabbits were completely gone. The flaw in this plan was that in 1911 there was a lot of unoccupied land! There were already rabbits in Latham when William A. McAlpine arrived in 1909. They weren't initially a problem but in 1916 McAlpine advised a Royal Commission that their numbers were suddenly increasing and would soon be a menace. Hesford Bros gave a similar report from their farm in Perenjori. In 1936 the local MLA for Greenough, William Patrick, campaigned that the government should cheaply sell off sandplain country as it was in grave danger of being taken over by the rabbits. The Rooke family arrived in Carnamah from Wales in 1915 to take up one of the Midland Railway Company's Ready Made Farms. In the early years rabbits formed a part of their regular diet in addition to cockatoo and wild turkey. Similarly the Underwood family in Coorow had some tough times during the early years on their farm and for a while they lived off rabbits and boiled wheat. James Underwood had been a saddler in Latham before purchasing a farm in Coorow in 1923. In 1914 regular cricket matches organised by Donald Macpherson were played between Carnamah and Three Springs. It was claimed by Three Springs that the Carnamah team endeavoured to hit the ball into rabbit burrows when the matches were held in Carnamah! Arthur Jackson was the teacher of the Billeroo State School in East Winchester. He often went rabbit shooting at night but on the night of 13 November 1933 he never returned home. During his expedition his gun had exploded and a bullet entered the side of his body and pierced his lung. After being found he was rushed to the Carnmaah Private Hospital, and recovering in Perth he resumed his teaching duties at Billeroo. Waddy Forest farmers Stanley L. Folland, Price W. Hunt and William G. Morcombe would go rabbit shooting and often shoot up to 100 in one day. 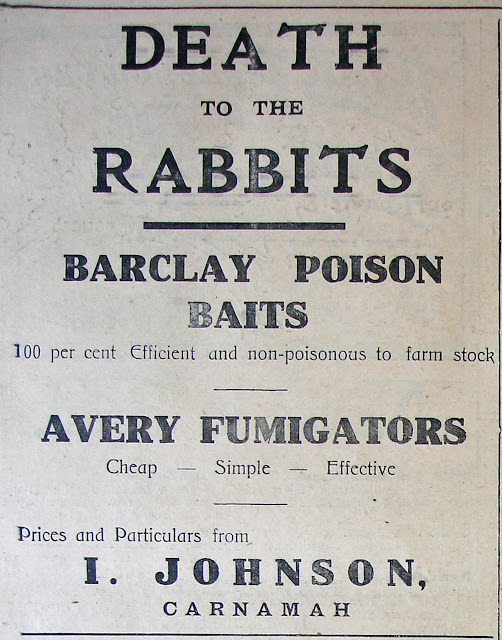 When Price died in 1947 among his plant and machinery was a Buzzacott rabbit fumigator and rabbit poisoning cart. 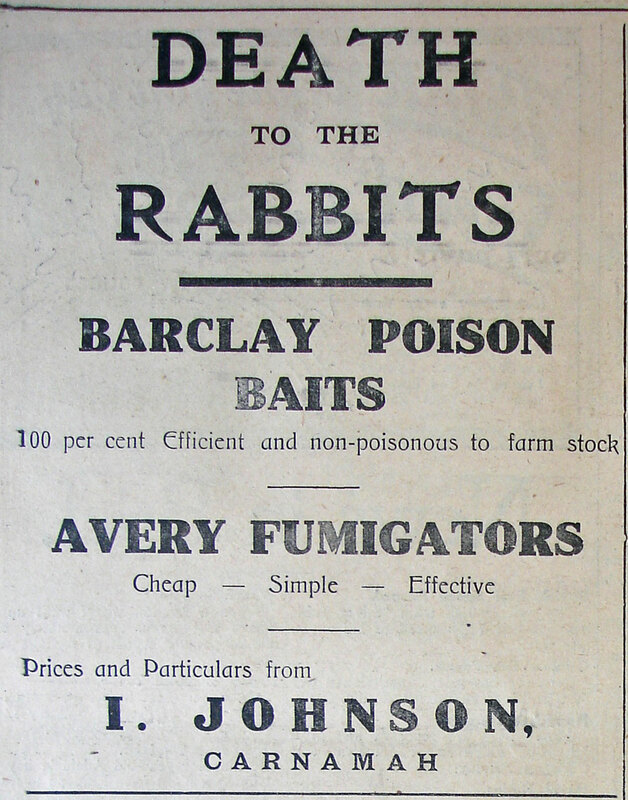 Some farmers had rabbit poisoning carts. The horse-drawn carts would have an attachment on the back that would dob out baits, which were often a mixture of poison, bran and pollard. On one occasion the workmen of Anster Tucker in Carnamah failed to clean the cart afterwards and a couple of cows licked the back. The vet came out and it was initially though it was his feed that caused the cows to ail so the cows were killed and his haystack burnt! In 1928 rabbits were abundant and were expected to wreak havoc on crops. A Carnamah resident wrote to The West Australian newspaper suggesting unemployed men should be put into gangs of rabbit trappers to help combat the problem. 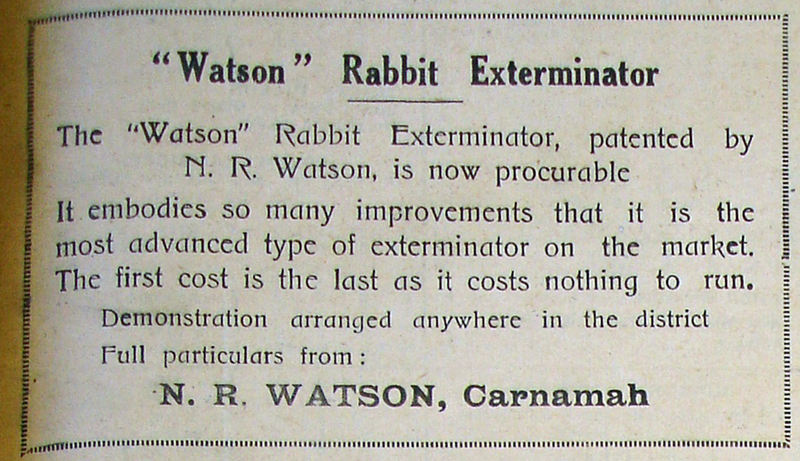 Carnamah local Norman R. Watson designed and patented his very own rabbit exterminator known as the "Watson" which entered the market in 1935. Unfortunately exploits in mass rabbit destruction were quite newsworthy. Mrs Hilda M. Cole placed strychnine in two freshwater soaks on her farm in Carnamah in January 1936 - which killed 1,190 rabbits. Another effort that made local headlines was Three Springs farmer James C. Hunt killing 240 rabbits over a few nights in 1934 with cyanide poisoning. 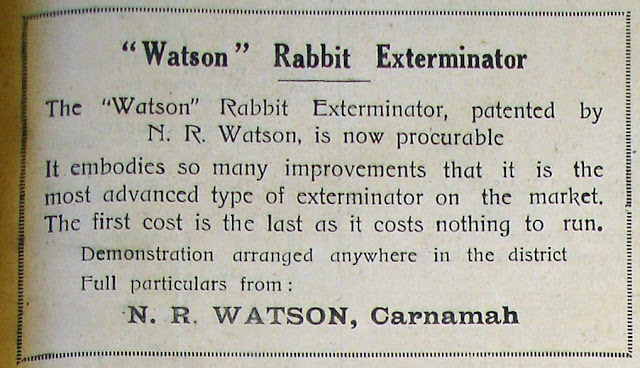 The Carnamah District Road Board imposed periods where all landowners and occupiers had to poison rabbits. In later years myxomatosis and the calicivirus reduced numbers, but rabbits most certainly still and will likely always remain.